Rehearsals spanned eight weeks instead of the typical four to six. The cast of 17 is much larger than those of most contemporary plays. The show requires lighting, sets, costumes, props and makeup that convey a shipwreck, magic and swordplay. The lines are tough to learn, and filled with poetry that can intimidate an audience. 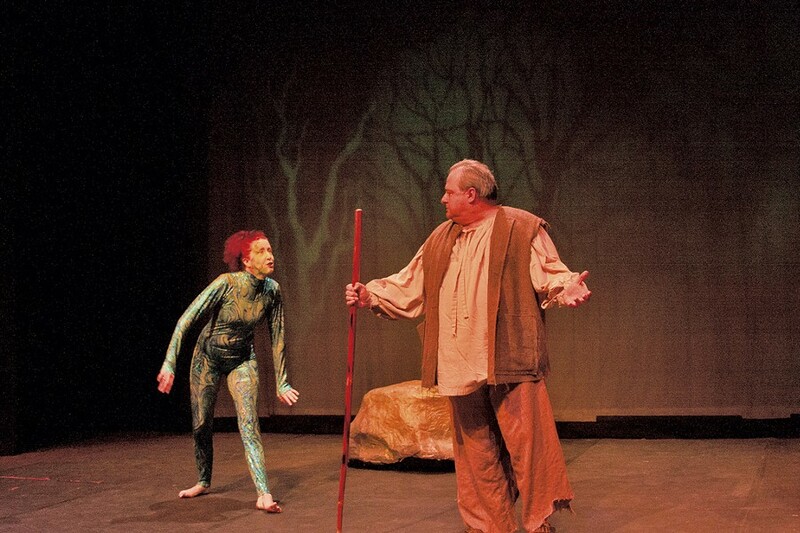 The Tempest is a challenge, even for veterans of the Shakespearean stage. When the Essex Community Players decided to stage the play this spring, the group understood the difficulties but also envisioned the rewards. Shakespeare's work continually beckons amateurs and professionals alike to bring to life the rich characters and brilliant language conceived 400 years ago. It's been more than a decade since the group last tackled Shakespeare, but when Cheri Gagnon suggested The Tempest, the play-reading committee agreed. Director Gagnon saw the production as an opportunity to reach out to younger people, helping to nurture the next generation of actors by including some middle school students in the cast. ECP, which has been putting on plays since 1958, draws on both regulars and new performers for this show. All are volunteers. The Tempest is generally considered the last play Shakespeare wrote alone. Some critics even detect in it notes of his farewell to the stage, as the main character, Prospero, abandons his magical powers and faces mortality. Adam Cunningham plays that role in the production that opened last Friday at Essex Memorial Hall. "The play is optimistic," he notes. "Other authors' final works sometimes express discouragement with the human condition, but this is positive." In rehearsal, Gagnon worked with small groups on sections of the play. Only two weeks before opening night did all the actors get to see the show as a whole. "All of a sudden," Gagnon says, "they melded into this tremendous ensemble. I've never had a cast connect that strongly." Gagnon studied theater and music at the University of Alaska Anchorage, then moved to Vermont and took theater classes at the University of Vermont. She started as an actor, but 20 years ago she began directing productions for community theaters in both states. "I've always enjoyed the intimacy and magic of theater," she says. "I always come back to it." Gagnon, who works as a physician's assistant specializing in pain management at the UVM Medical Center, calls theater "the perfect antidote to what I do all day." This is her first time directing Shakespeare, though she's acted in several of his works. "I was fortunate enough to have an extraordinary teacher who taught me how to address Shakespeare as an actor," she says. To help amateur actors prepare for The Tempest, Gagnon conducted a workshop before auditions to equip them with fundamentals. In rehearsal, she concentrated on making sure the actors could convey the meaning of the text. "We spent a lot of time learning the rhythm of the language, dissecting it," she says. "What does it mean? What did you just say?" Community theater requires actors and crew members to carve out time on top of their paying jobs. Cunningham, whose professional training includes an MFA in acting from Brandeis University and years of off-off-Broadway work, now works for an insurance company. He's impressed with the commitment of ECP's amateur actors. "It's truly amazing how hard they work, and all for love, not money," he observes. "There's a lot of dedication, and there are talented people whose need to do theater is so strong." Cunningham relishes his role as a magician who comes to terms with the limitations of magic. "I learn that I'm sequestered in my magic," he says of his character. "It's not the ultimate power, because it's removed from people. I have to accept all of humanity, not stand apart from it." An interest in the human qualities of the characters is the basis of Gagnon's directorial approach. She wants to assure the audience that Shakespeare's plays are about real people, accessible to anyone. Cunningham admits that Shakespeare "does require an audience to do more work to engage with the language. But if you let it wash over you, you discover the rewards." The play has beautiful speeches but plenty of action, as well. The story focuses on a shipwreck, a bond between father and daughter, a love story and a magical world. "My goal was to identify the humanity of Prospero as a father," Gagnon says. She hopes the audience will include those who consider Shakespeare daunting. "I want to undo any damage done by bad introductions to Shakespeare in school," the director says wryly. "My actors are going to make sure you understand what's going on, and it's going to move you." The original print version of this article was headlined "Essex Community Players Get Their Bard On With The Tempest"